The Westmoreland Elementary School underwent a major expansion with a $7.4 million, 16,540-square-foot addition that included eight classrooms, a new media center, two small group instruction rooms, two student bathrooms, and new space for special education programs. Stormwater from the new addition needed to be compliant with NJDEP regulations for stormwater treatment. Engineers from Lan Associates chose the Stormwater Management StormFilter. StormFilter is a stormwater treatment device comprised of one or more structures that house rechargeable, self-cleaning, media-filled cartridges that trap particulates and absorbs pollutants such as dissolved metals, hydrocarbons, nutrients, metals, and other common pollutants found in stormwater runoff. 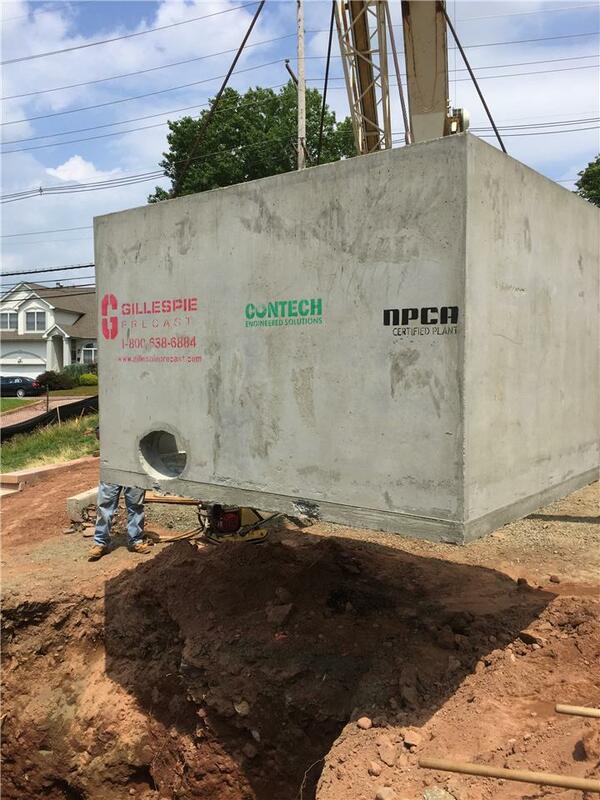 For this site, an 8’ x 6’ precast concrete vault was built that houses eight cartridges. The vault is equipped with a inlet grate and manhole cover. The filter media in the StormFilter cartridges can be customized to target site-specific pollutants. In this application,the cartridges contain Perlite, which is expanded volcanic rock. Perlite’s porous, multi-cellular structure and rough edges make it effective for removing TSS, oil, and grease. Installation was performed by D&L Paving Contractors in minimal time. The vault was lifted from the truck via crane and placed into the ground. The grate and manhole cover was then placed on the vault.